Hugh Lewis moved in to Woodfield House in 1889. Apartments now occupy the site of Woodfield House, but the curious garden wall, fourteen feet high in places, which runs alongside the footpath which separated Woodfield House from no. 174 Hill Village Road, can still be seen. Hugh Lewis had acquired a large quantity of bricks cheaply, and he used to stop tramping men making their way along Lichfield Road to find work in Birmingham, and offer them a square meal in return for a stint on building the wall. Lewis was born in Tipton at his father’s pawnbroker’s shop, a business which he eventually took over and ran successfully for fifty years. He was an eccentric - as a pawnbroker he drove a hard bargain with his poor customers, but another day he would have a generous impulse and distribute free bread and ale among them. He grew rich through making shrewd investments, and after his wife left him in 1865 he became more miserly and reclusive. 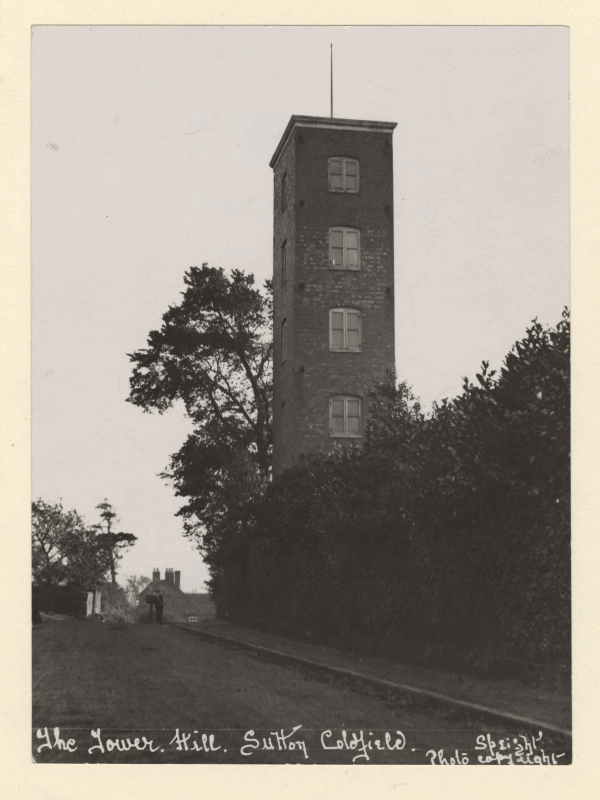 In 1891 Hugh Lewis decided to build himself a look-out tower in Hill Village Road. The tower, five storeys high, was built opposite the entrance to Sherifoot Lane by the builder Walter Hastilow. His object in building it may have been to give employment in a time of recession; some said the eccentric old man went up the tower to see if his wife was coming back to him, while his answer to a direct question was “well, you can see from the top what you cannot see from the bottom”. When he applied for planning permission to build the tower, Lewis explained that it could be used for occasional firework displays, and fireworks were duly let off from the roof on at least two occasions, Queen Victoria’s diamond jubilee in 1897 and the intended date of Edward VII’s coronation, June 26th 1902. Both days were celebrated with an ox roast opposite the tower followed by fireworks - in the event, the coronation was delayed through the king’s illness, but “the ox could not wait”, so the party went ahead. When Hugh Lewis died at the age of ninety in 1908 everyone was surprised that someone who lived so frugally left such a huge fortune - £80,000, all bequeathed to a hospital in Dudley. The tower became unsafe and was demolished in 1913, but the garden wall remains as a reminder of a strange character.